Slice the uncooked bacon in half, so the strips are half as long as they originally were. This makes the bacon easier to cook, but if you prefer to cook whole slices of bacon, that’s fine too. Place the cooked bacon on some paper towels to soak up the remaining grease. Separate 6 or so leaves from the head of lettuce. Roll the sushi. 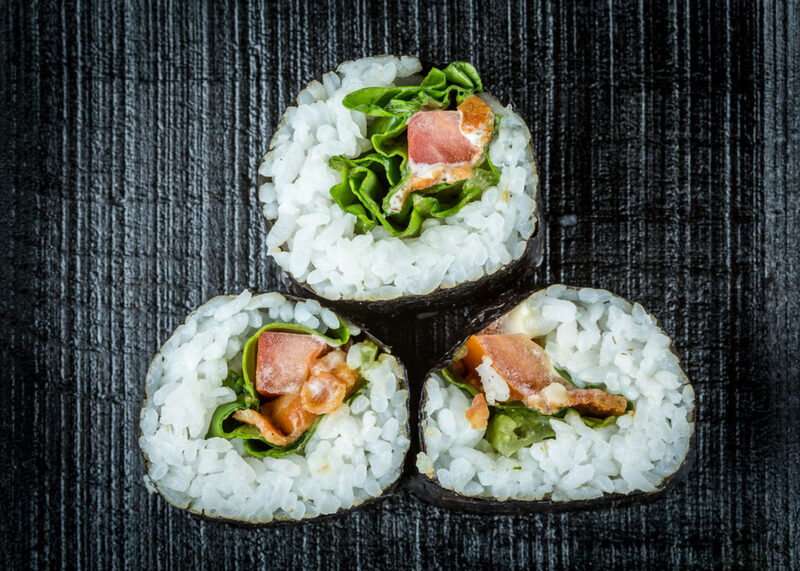 For your fillings, place a lettuce leaf on the sumeshi-covered nori, then place the tomato strips and about 4 pieces of bacon on top of the lettuce – then roll the sushi as you normally would. I stumbled on a picture of sushi on the “Everyone’s Photos” stream on flickr, and came across this wonderful site! I showed my girlfriend, and we’re now hooked! So clever! Everything does taste better with bacon! It’s funny, I ate a BLT just today. If we thank New York for nothing else, thank them for this. Oh right, the roll. Well, I learned that bacon is really a good flavor for sushi (I mean, when do you not want bacon), and the tomato goes well. The lettuce, I don’t know. I think it’s the combination of seaweed and lettuce – maybe it’d be better without any nori? Then you just have a BLT with rice instead of bread. I think at this point it’s safer to go get the actual sandwich if you want a BLT. But really, I never expected bacon in sushi. Unorthodox ingredient selection is this year’s black! Mmm, bacon! Funny, I used to make them without the lettuce because I’m not that keen on lettuce in my sandwiches! Then I put Egg in it instead so it became a BET sammy 🙂 Nice roll though, I want to request it at restaurants now *drool! Morgan – Yay! Son was the one who convinced me to put the sushi pictures on my Flickr account, so you can thank him for that! I hope you and your girlfriend have fun making sushi! Nick – Hmmm interesting… rolling the sushi in lettuce instead of nori sounds like a good idea, especially for something like a BLT Maki! Yvo – hehe that sounds good! Hi, I just found your blog through the well fed network. You were nominated there. I haven’t tried BLT maki yet, but I definitely will. It sounds so good. By the way, do you have a monthly archive? I want to read your old post by chronological order. Thanks.